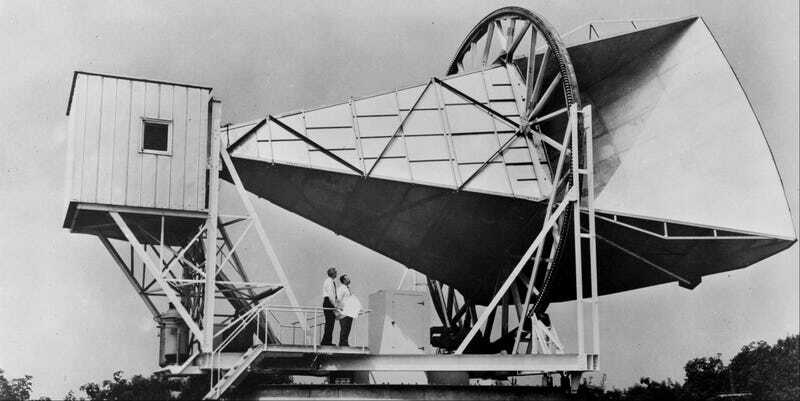 In 1964, a pair of Bell Labs researchers in New Jersey pointed the world's largest radio telescope to the skies and unwittingly stumbled upon one of the greatest discoveries of the 20th Century: cosmic background radiation. We talked with the legendary physicist behind that breakthrough to find out more—and with the president of Bell Labs to see what the future holds for one of our finest research institutions. Ahead of today's Big Bang Celebration at Bell Labs, which honors those groundbreaking revelations, Gizmodo sat down with Nobel prize-winning physicist Dr. Robert Wilson and Bell Labs President Marcus Weldon to discuss both how that fateful discovery has impacted our understanding of the cosmos and what Bell Labs is doing to reignite scientific discovery in America. Gizmodo: Can you give us first a brief overview of your time at Bell Labs and the discoveries that you made there? Wilson: All right. Let's see. I guess you probably heard in the video I came directly to Bell Labs from Cal Tech where I was a graduate student. There was a recruiter who came around about twice a year—astrophysics and engineering people were at quite high demand in the country as we responded to Sputnik, there was considerable interest—which was very lucky for me. I decided that Bell Labs suited me in many ways, because there were quite a few of the projects I was interested in, but the most interesting was teleradio astronomy. And actually the communications work would also be interesting. It was agreed by management that we'd spend half our time on astronomy and the other half for something on the Bell system working on communication satellites. That actually wasn't spelled out because, in fact, COMSAT had been created and AT&T had been ruled out of communications satellites, so it wasn't clear what was going to happen there next, although in the end they figured out that domestic satellites could be interesting too and they did several experiments that way. Giz: And that was related to the launch of the echo balloon? Wilson: No, that was later on. So the Echo, then TELSTAR, were very much oriented to intercontinental satellites. Something to replace the ocean cables. And I guess by the time I got here, the horn of rector had been set up to receive a TELSTAR beacon. Penzias and I got permission after a while to take that apart and convert it to radio astronomy. And I guess you've heard the story about what we did and what we'd found. Giz: Yes, could you give us a general overview of what you did discover though? Wilson: What we did that had not been done before was that Arnold built a liquid helium cooled reference source, basically a microwave absorber, surrounded by liquid helium, that would radiate at the temperature of the helium, and I set up a switch and a way of measuring so we could compare that with the antenna. And what we found immediately was that the antenna had considerably more noise than we'd expected, hotter. We tend to speak of the thermal noise in terms of the thermal temperature, because that's the easiest way to calibrate. I say that as using liquid helium, so we could compare liquid helium to a room temperature absorber as one way of calibrating. And so when I say temperature, I really mean tower in the band of interest. So we found there was more there than we expected, however, we were into a project for measuring a radio source called CAFE, which was the brightest source in the sky, and by then a fellow named dave horn and I had already measured the gain of the twenty foot horn reflector by flying the source in a helicopter. And that was a fairly big deal, and so we didn't want to disturb anything for quite a while until we actually used that gain measurement to measure something in the sky, so it was almost nine months that we watch and saw the same noise whenever we weren't looking at any known source, you know it just didn't change. We kept thinking of what the problems might be and we looked out, we got to the point where one more experiment we were willing to do, and we were put in touch with the Princeton group. I'll go through that story again but I did that in the lecture [the video above - ed]. Giz: With such an important discovery, as cosmic background radiation, what brought you guys to share that Nobel with the Princeton team? Wilson: Oh no we didn't share the Nobel with them. Well, we didn't know what we had. We had excess noise, we didn't know where it was coming from. The Princeton people had a theory of where it was coming from. You might ask why didn't the Princeton people share in the prize, well it turns out that George Gamoff, Ralph Alpher, and Herman, I forget his first name, they had the same ideas, that a hot big bang would leave radiation in the universe that might be measurable. Although I don't think they thought it was measurable, although at one point they'd did in fact predict that 5 kelvin might be the temperature of the universe. But they made no effort to measure it other than asking a couple of people if it was possible, and unfortunately for them they were told no. So the theory wasn't new, although clearly the astronomical constant that needed to go into it had improved some since the 40s, but by the 60s. But those numbers were still very crude from our present point of view. I believe that, Jim Kebils had predicted something like 10 Kelvin for the brightness based on the numbers that he had at hand. So they were a little surprised that it was low, when they came over and looked at what we had, they were good microwave people, they could see that we'd been very careful about what we had done. I have no idea what deliberations the nobel people had in deciding who to include and who not to include. Giz: For something a bit more recent, the recent discoveries of the Higgs Boson and what's been discovered by the BICEPT 2 telescope in Antarctica, what are your thoughts on those discoveries, and do you feel that they are even bigger discoveries than your initial find regarding cosmic background radiation? Wilson: Umm, the Higgs, uhh seems like an important discovery in physics, although I am not an expert in that. Actually, Jon Kovak who's the PI of the BICEPT 2 team, has an office next to mine in Cambridge. Wilson: And so I was really excited by that, in fact. You know, we really didn't realize in 1965 how big and how important the cause of background microwave background was going to be. The thought was at that time that it would be completely uniform, since its variation is a few parts per million, it's not a bad approximation, but the ability to measure has improved so much that there's been a tremendous amount of information that's been derived from what you might call the picture of the baby universe, at two hundred and seventy eight thousand years of age. And it's just been amazing to see how much has come from it. And the BICEPT thing, I think in some ways its rather astounding that only assuming that the measurement holds up, it not only sort of verifies the last part of inflation theory, and we can talk about inflation in just a bit, but it also brings up the reality of quantum gravity. If you may know Einstein spent the last part of his life trying to put general relativity and quantum mechanics together unsuccessfully. And a few other people have tried and made a little progress, but there is no such theory at this point. But the BICEPT measurement indicates that there were quantum fluctuations in gravitons at the time. Which is not surprising, just that we didn't have a theory for it. So if we're going to push physics as well as astrophysics. So inflation is sort of remarkable in that it was invented in a way to solve two problems with the big bang, one of them being, both in how it got started. One of was why is space so flat, or why was the density exactly the critical value. And the other being why do we see the same temperature when we look in different directions, because the material which at 280,000 years radiated, or last interacted with them, had never been in causal contact between the two. Wilson: So inflation was a way of solving that problem. Then it predicted the fluctuations which Plank saw, and predicted the polarization, the simple mode polarization, which was found some years ago, in fact Jon Kovak was a part of that project also, and now its predicted this interaction with primordial gravity waves, the quantum fluctuations, during the inflation of producing the gravity waves. So, its a rather remarkable set of predictions to start out with one little bit, it's what science is supposed to do of course: you take a little bit and you make plausible theory, and if tis a good theory it'll predict several other things, which could be verified. Giz: That actually leads me to my next question, was there any equipment that you'd wished during your career that you'd had access to, or even today that you wish you could play around with in order to push the boundaries of physics? Wilson: I considered during my career at Bell Labs that I was very fortunate to have access to Bell Labs development and inventions that were done largely for communications, but i had the privilege to apply them to astronomy and astrophysics. The first of course was the horn reflector and the MAZR amplifier, but later in 1970 Arnold and I took the receiver that Charlie Burs down the hall had made for millimeter communications, and used it to discover carbon monoxide and many other molecules in interstellar clouds. That's the way new stars are formed. In fact, we built a seven meter diameter antenna on Crawford Hill with two purposes, one was to investigate satellite communications at shorter wavelengths, and the other was if the radio was good, to do radio astronomy. We did quite a lot of mapping of clouds even though you might say that 300 feet above sea level on the east coast is not an ideal site. But given access to it 24/7, you could pick your good times and could be very productive. And it was good that the synergy between doing the measurements for satellite communications when the weather was bad and doing astronomy when the weather was good. We could do either of the projects the other part of the time. Giz: You mentioned in a recent presentation that there was no real "Eureka!" moment with your initial discovery of background radiation. Does that disappoint you at all? Were you hoping for something like Newton's apple falling onto his head? Wilson: Oh, we were mostly trying to figure out what our problem was at that time, and why we weren't getting the answer we should, or thought we should. We believed in physics and that what came out of it had to come some source, and we were really getting very puzzled. But I think cosmology at the time had not explained very much and we felt very cautious about the cosmology, it was only over time that it really became evident that was really the source of it and that it was an important source that would tell us about the universe. The carbon monoxide story on the other hand was completely different. We set out to measure it, we spent quite sometime building the best receiver we could, we took it to a national radio astronomy observatory at Kip Peak near Tucson, and after Keith Jeffers and I got the receiver working out there, there were still some bugs to deal with, it took almost a week of trying to get it to go, when it went, I asked the antenna operator to point the antenna at a place in the orion region where we knew there were two interesting objects—and I was watching the real-time output, at that point, well there was a computer that drove the antenna, but not that took data or allowed us to really look at it, but the reporting channels of the spectrometer and there was the real time output with a two second time cut, but these were analogue, so each one had its own characteristic, so anyway... so I was watching this cluster of points on the telescope and suddenly the ones in the center went up, so I asked the operator "did you get to the source," and he said "yes," I said, "please move off," he moved off, and they went back down. In 20 seconds or something we found carbon monoxide. When I called home my wife said that's the most excited she'd that's the most excited she'd ever heard me. Giz: That's fantastic. Thank you so very much for taking the time to speak with me today, it's been a great honor. Giz: If you could, please give us a quick rundown of what Bell Labs has been up to for the last couple of years? I know you just came on as president in November of last year, what have you guys been up to for the last couple of months? Weldon: We've just been resting on our laurels. Weldon: Haha, no. Well, it's a very interesting time. Obviously I was a Bell Labs researcher way back when before I became CTO [at Alcatel-Lucent], and now we've combined CTO and Bell Labs. So why is that, you could ask. Why would you combine CTO and Bell Labs? It's been done in the past and it was in this case recently. Actually, for the following reason: it's to remake the connection between Bell Labs and industry direction. Historically—and the Big Bang Celebration we've been talking about is a very good example of this—Bell Labs has been in its primacy when it was solving big industry problems. In the case of the Big Bang, it was all these satellite communications, a satellite, and a thing dangling from a balloon, which was also a mini-satellite; they were trying to figure out radio communications and they discovered the microwave background radiation. And Bell Labs historically was always in that mode—big challenges in the industry around information telecommunication networking—and go on to that challenge, hire the smartest people, and because they were smart and unique minds, they would see the stuff off to the side, which in the case of the Big Bang was the microwave cosmic background. So I have essentially been charted with returning Bell Labs to its classic configuration of solving big challenges in the industry and, therefore, connecting CTO and Bell Labs. CTO gives the vision for the industry while Bell Labs provides the fuel, or the engine, to solve those big problems, and that's really what I've been driving the organization to do. I've used two methods. I want them to solve what I call "TenX" problems, problems that I want to be 10x better than anything today; more capacity, 10x lower latency, more scalability, 10x lower energy consumption. So they're going up to TenX problems and then we combine some of those TenX pieces of research into what I call "FutureX Projects," which are just projects that take a few things, put them together to create something that's more than the sum of its parts. That's really what I've been driving for the first few months, refocusing on the big industry challenges where big means TenX and then combining individual ideas into ideas that are greater than the sum of their parts as FutureX Projects, and I can talk about what the X in FutureX means if you want to know but that's my first statement. Giz: Can you share any FutureX projects that you're currently working on? Weldon: So let me explain the X first because there have been some articles on Google's X labs and whatever. The X for us means the following: X for a start means the TenX. These projects, of course, have been made up of TenX pieces of research, so the whole project should deliver TenX, so its obvious, the roman numeral X, for ten times. X is also the variable of 'we don't know' this yet. It's knowing the problems but with unknowable answers currently. So it's going after the unknown in many ways rather than saying we know the answer to that and then go after that and just build something better. We're actually going big enough that we don't always know the answers. So the X is the uncertainty of the variable X. And the other degree of X is there are ten of these projects, generally. So we have ten projects aimed at solving a challenge that is ten times better, or bigger, or faster than today, and we're going to solve these, but some we have already innovated on — we've got sort of a backlog of innovations if you want—but some of them have big unknowns, so we don't yet know how to solve, and that's sort of the classic genius of Bell Labs. And the other X that I don't really like as an X is ten years. What I mean is that I don't really want to wait ten years to solve it but I want the definition of the problem we're solving to be what the world looks like 10 years from now. I just want to solve it faster than that. There is an X that ten years from now but it means that's the reality we'll be living so hopefully we solve the problem well before that. Does that makes sense? Weldon: So you asked for some examples, and they're the classic ones. You could argue that 5G is an obvious one, and we call that project "Future Connected," recognizing that all future connectivity will be wireless. It may be very quickly onto a wire but the world of smart phones, machine to machine, tablets, etc... it's a wireless world that quickly gets onto a wire but it's a wireless problem. So 5G, we call that project "Future Connected," and you can see it has multiple dimensions with the radio and the packet core, the virtualizations, and new air interfaces. That's how we might bring together 4 or 5 pieces of research and put them into one project, so 5G, or "Future Connected," is an obvious one that gives you an example of these types of thing. We've got another on the future data center, looking at having a more optical data center. You could start disaggregating computers, storage, and memory, and actually have a more optimal interface between servers, their memory, and their storage as we're looking at an all-optical future data center, that project is called "Future Data Center," of course. There's another one called "Future Comms," or future communications, about reinventing communications for a Twitter, Facebook, and Instagram enabled world, so that we're reimagining communication in collaborations with a chat-based methodology that will allow you to control your interaction with anything and anyone as if you were chatting to that object, and so it's a very new way of looking at communications. The message interface will actually define how you interact with objects, people, services, media, and so that's why it's called future communications. So that's just three examples of the FutureX projects. Giz: Interesting. So for the Future Comm, are you saying that's the new internet of things? My internet-connected refrigerator, or coffee maker—I will be able to interact will those objects? Could you clarify what that project does exactly? Weldon: So that's why I got a little vague on you. Weldon: Haha, it might be exactly what you said. In fact, the hint might be, you'll interact with everything the same way in a way that's intuitive and short-message based in new and interesting ways, but it gets much richer and much more complicated in that the interaction is you chatting with things, and that will cause remarkable things to happen. Giz: Oh, I see. You're enabling that conversation to even happen in the first place. Now are these all specifically in-house projects or you collaborating with governmental agencies such as NASA, DARPA, or any research universities? Weldon: We always collaborate with universities. We have an active program of university collaboration of probably 13, 14, 15 universities. In terms of government funding, we typically use that for some of the work we've done in the past, but that generally comes through our LGS subsidiary [which handles sensitive government technology contracts - ed] that we just got spun out, so we won't see much government funding there. So we're mostly internally funded, we have support from the company to do these new and interesting things. But what I would say is that this connects well to the Bell Labs prize. One of the things we're launching at the Big Bang celebration is the new Bell Labs prize, the first ever external Bell Labs prize. It will seek to get ideas on either the existing projects we have to the extent that they will be made available for people to see at a high level, but there will also be new ideas, or new FutureX projects, launching an open call with $100,000 as the first prize. But the interesting part is that you will get to collaborate with a Bell Labs researcher. So the selected ideas, of which we expect there to be a few tens of ideas, will actually be paired with a Bell Labs researcher, and that'll allow your idea to grow in the magic of Bell Labs into something more realizable, bigger or faster, and then be ultimately judged by an industry panel of imminent people who will award the final prize. So it's collaborative, external call for the best ideas on FutureX things, but you get to collaborate with a Bells Labs researcher through the second phase of the prize before the final judgement. So it's a neat opportunity, we think, to reach out to others, which is really what your question is, and collaborate with others to invent the future. Giz: Interesting. What happens to the prize winner? Is that technology developed further in collaboration with Bell Labs? What happens after you win the prize? Weldon: If conditions are right, there will be an offer for you to join Bell Labs for a period of time, and so that's a strong option that we made available. It's not actually possible in all environments, which made me hesitant because in some countries, in fact, it's not possible to tie those two things together. Wherever possible, we will be offering a short-term contract to the winner as well as the prize so they can continue to grow their idea and within Bell Labs and have it become a reality. Giz: Interesting. So this is open to basically everybody in the world, it's not strictly U.S. submission. Weldon: It's open to everywhere we can legally get the prize certified. Unfortunately it comes down to the legal language. It turns out that every country has to register such a prize. It's how governments make money by forcing you to register, but basically "prizes" come close to this legal definition as you have to actually guarantee you have the prize, you have to guarantee that the judging process is fair and transparent, and each country has different rules for that. So you have to register that your prize abides by the rules. So we've opened it up to about 40 countries, and that 40 is simply limited by the number by the locations we could get certified in the time we had available. Giz: That's perfectly understandable. Are there any other aspects of the Big Bang celebration or is this just to announce the inception of the prize, aside from, obviously, the 50th anniversary of Dr. Wilson's discovery? Weldon: In many ways the prize is trying to find the next Dr. Wilson. If you remember, what they were doing was working on radio communications and they saw something off to the side. So the prize is about that same model of solving the next big problems in communications and information technology, and finding people that in solving those problems have the mentality of seeing things off to the side as well. So that's really why the two are coupled. We could have separated them but they're logically coupled because we're actually looking for those things, but it's not the Nobel prize necessarily. We're looking to solve big industry problems, finding new talent to solve those problems, and helping that talent in the Bell Labs way solve that problem but also see the stuff to the side. Giz: So that's all within the framework of telecommunications, technology advancements, because you all shifted away from the hard basic sciences in 2007/2008, around there. So your advancements are going to be coming through telecommunications technology with the hope that you'll discover something "off the side," as you said, that meets more basic sciences? Weldon: Yeah, it's worth explaining that era where Bell Labs was focused on basic sciences was a bit of an anomaly in terms of Bell Labs. And it happened for a specific reason: the industry starting being in a bit of disarray. It was going through various devolutions: the web was coming up, web companies were appearing, wireless was becoming big... so much flux that the industry stopped being a sponsor of research in some ways. And in that way Bell Labs more or less became autonomous and started working on law, as you said, or basic science problems. The reality is that everything up until 1980, you could argue, maybe 85, was almost focused on solving real world problems and just happened to find the basic science because we hired brilliant people who were capable of thinking about the science whilst they actually solved the problem. So all we're doing is saying that we're looking for people like the old Bell Labs, the classic Bell Labs, who can solve big problems but that will also be smart enough to actually understand the science behind the scenes, and if we happen to win a prize because of that, that's fantastic, but that's not the goal. In this period, to me, people thought the 90s at Bell Labs were the classic era - that was the year when it became more of an academic institution, and then the industry didn't need it anymore. And so we're back to being the classic era, mind you, solving real world problems but hiring smart enough people that understand the science so they naturally uncover the science. Does that make sense? Giz: Absolutely. That's very renaissance-esque. So getting back to the TenX/FutureX stuff, where do you see Bell Labs in 10 years and the industry itself? Weldon: Yes, that's a tough one. So I have this vision I'm about to write a blog about, where in ten years I honestly believe that the paradigm will be the network of you, rather than you attaching to a network that is the same for all people in all circumstances in all applications. The network will actually morph itself and adapt itself to reflect your needs wherever you are and for whatever you're doing, and so the network becomes sort of a "digital skin," I'd like to say, that surrounds you and connects your physical world to your digital world. It's always adapting like any skin does to conform to your needs at every point in time. So that's the paradigm I think, but when I think about what that might involve, it's many of the things you think Bell Labs might be great at. Definitely new radio techniques, right? New infrastructure of the radio layout, too, which if you think of have elements of 5G. It's also virtualization - I want to be able to uproot pieces of my network and repart them, or recreate them, somewhere else, and that's what virtualization is about: following the needs of the users as opposed to fixing my capacity to access physical points. I want to dynamically change all that, so that's where SDN comes in. I would obviously want to be able to manage the routing and optical piece of that so the traffic can flow from anywhere to anywhere and not just from the radio layer, but the network behind it. I want to do a dynamic control of the IP optical layer, and then I want a control plane that is smart enough to figure out the right thing to do. And that's a big math and algorithmic problem requiring a very complex calculation to do the right thing for everyone everywhere. When I say it that way, it sounds easy but it's incredibly complicated. And if you think about all those ingredients, that's what Bell Labs historically has been brilliant at and it's what we need going forward to build this sort of "network of you." For more information on how to submit your research for the Bell Labs prize, click here!